This week’s challenge at Hand Stamped Sentiments is a sketch challenge so I used the opportunity to finally use the stamp set Pedaling Past and to also participate in Pals Paper Arts color challenge. 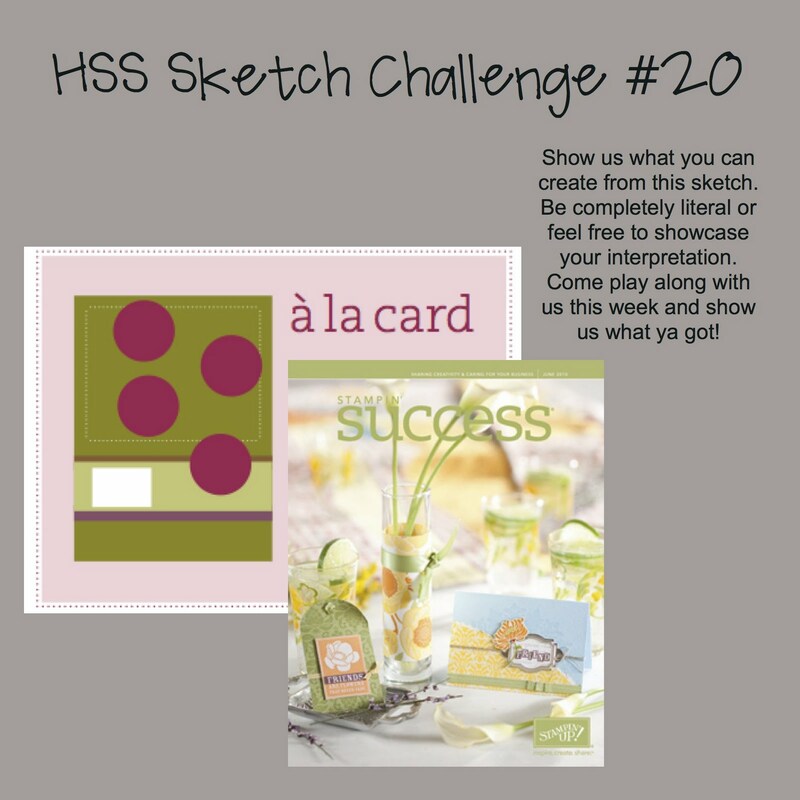 The sketch comes from the June issue of Success magazine for demonstrators. The color challenge at PPA is Bermuda Bay, Crushed Curry and Soft Suede. I love this stamp set, Pedaling Past because it looks vintage. Therefore I wanted my card to look old and distressed so I used the distressing tool on the cutter kit for the edges of all layers on my card. I also used My Digital Studio to print out circles with the cog punch. The cogs and circles are one layer but shadowing on the cogs gives them dimension. I stamped the bicycle image with black Stazon then watercolored using my ink pads . I also used the border image and the sentiment from the set and used the Curly Label punch for the sentiment. All edges were sponged with Soft Suede. Here’s my hybrid card. Wow! Love what you did with Pedaling Past! Terrific card! Thanks for playing at PPA! Very cute! Thanks for joining us at PPA! This is a great card! Great colors and cogs. I would have never guessed that those cogs weren’t punched. This is gorgeous! What a fabulous combination of colors and design. Gorgeous card, love the image and color combo!!! Beautiful!! My son just chose at random a nearly similiar color combo, lol – this is a beauty! Very cute, love all the different elements you used! This is such a great card, love the colors, cogs and that it all ties in with the bike. Great! What a great card! I love the image. Fabulous colors and layout! !